Microsoft Surface laptops are now eligible for “recommended” status in Consumer Reports’ ratings. Last year we removed that designation because of poor predicted reliability in comparison with laptops from other brands. Reliability evaluations are based on surveys of our members. We now have results from our latest survey. “Microsoft’s reliability is now on par with most other laptop brands,” allowing its products to be recommended, says Martin Lachter, a senior research associate at Consumer Reports. This is the first year that brand reliability is being factored into the Overall Scores for many products rated by Consumer Reports. Owner satisfaction, which is based on the same survey of our members, is also being incorporated into the Overall Score. The new reliability scores are ready just as we’ve completed our lab testing of the recently released Microsoft Surface Go. That 10-inch Surface Go, released in August, is meant to be a two-in-one laptop, though a keyboard must be purchased separately. The Surface Go isn’t receiving a CR recommendation, but that’s based on the results of lab testing, not member survey data. Microsoft declined to comment on CR’s latest findings. The Microsoft Surface Go isn’t alone in putting up lackluster performance marks. Generally, 10- and 11-inch laptops struggle in Consumer Reports’ testing because of their relatively weak processing power. (It’s more difficult to fit powerful, battery-hungry processors in smaller laptops when there’s not a lot of space for a large battery or sufficient heat dissipation.) 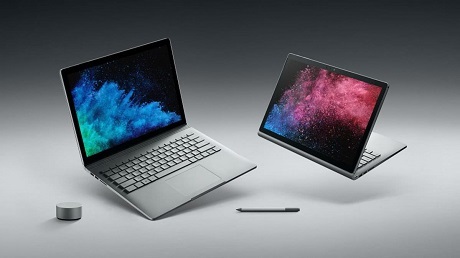 Currently, only two models out of 10 in that size category are recommended, the Samsung Galaxy Book 10.6 and Acer Spin 1 SP111-31-C2W3. The less expensive model scored one overall point better in our tests because its battery lasts 11 hours. (The battery in the more expensive model lasts 10.25 hours.) The more expensive model, however, was just slightly faster, owing to its use of SSD storage instead of eMMC (a slower form of flash memory), according to our testers. Note that both computers ship with Windows 10 in S mode, which restricts you to apps that are available in the Microsoft Store. But you can upgrade to Windows 10 Home, which CR did in order to test them. Microsoft is expected to announce new Surface devices Oct. 2 at an event in New York. Consumer Reports will purchase and test any new models once they become available at retail.